Rabbi and scholar; lived at Rome in the second half of the thirteenth century. 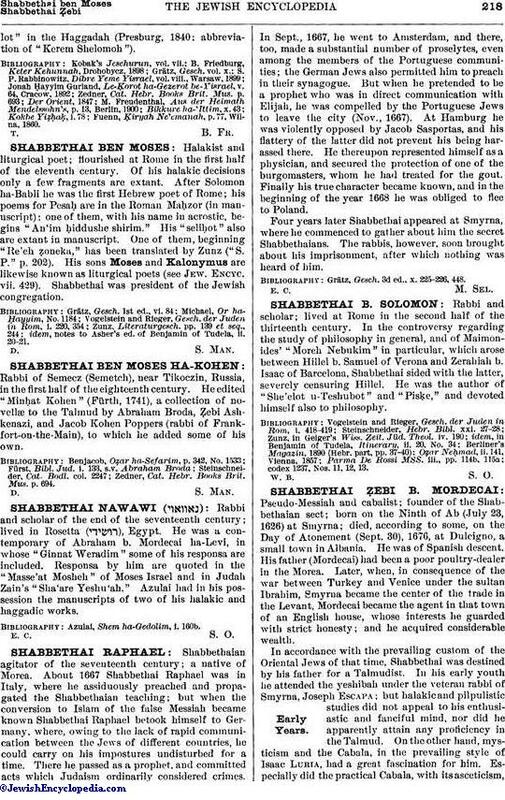 In the controversy regarding the study of philosophy in general, and of Maimonides' "Moreh Nebukim" in particular, which arose between Hillel b. Samuel of Verona and Zerahiah b. Isaac of Barcelona, Shabbethai sided with the latter, severely censuring Hillel. He was the author of "She'elot u-Teshubot" and "Pisḳe," and devoted himself also to philosophy. Parma De Rossi MSS. iii., pp. 114b, 115a; codex 1237, Nos. 11, 12, 13.